The ribbon cutting ceremony for one of downtown’s newest attractions, Maniac’s Mansion, was held on March 29th at 710 8th St.
Marcus McGee, a.k.a. 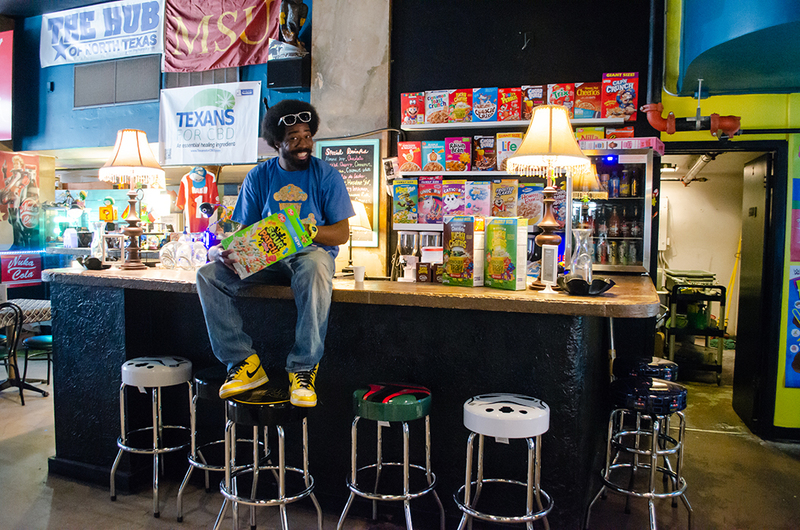 DJ MF Maniac, has opened up a free-play arcade/cereal bar/modern toy museum in the old section of the 8th Street Coffee House. I asked him what this place is, and he replied, “It is basically my home. It’s all my personal stuff that I have been collecting all my life. 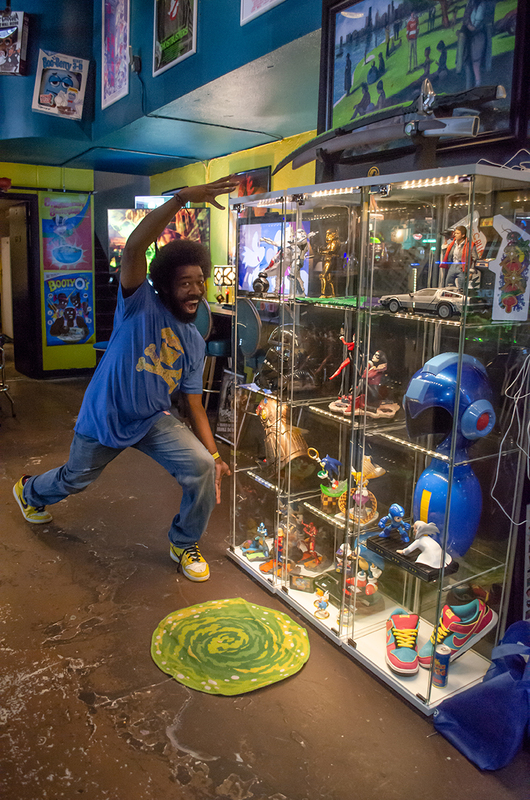 I used to not throw anything away- lunch boxes, cool cereal boxes, replicas from movies like Robo Cop’s gun, the Infinity Gauntlet from The Avengers, and anything from Back To The Future that I can get my hands on.” And he has some nice glass display cases to show them off. 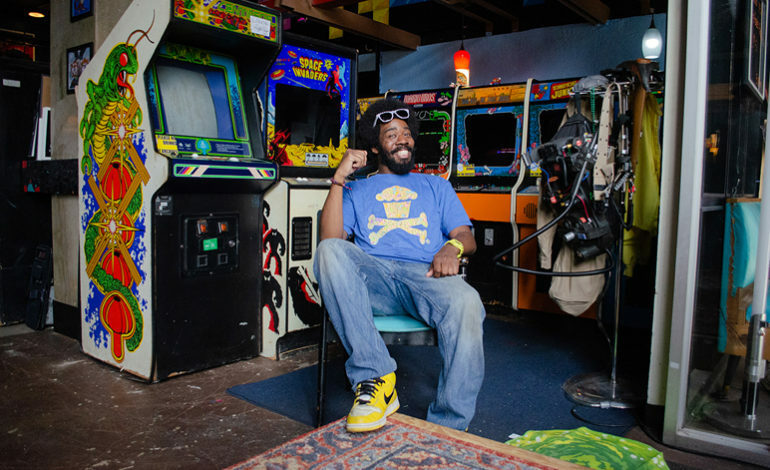 Marcus currently has 18 arcade games set up in the mansion, including some arcade one ups, which are mini versions of classic arcade games such as Asteroids, Centipede, Galaga, Rampage, etc. He says that he put these one ups in basically for the kids, but he was surprised to see how many older people (65+) would sit at them for hours. Additionally he has some modern gaming systems set up like Xbox1 and PS4 with virtual reality games. 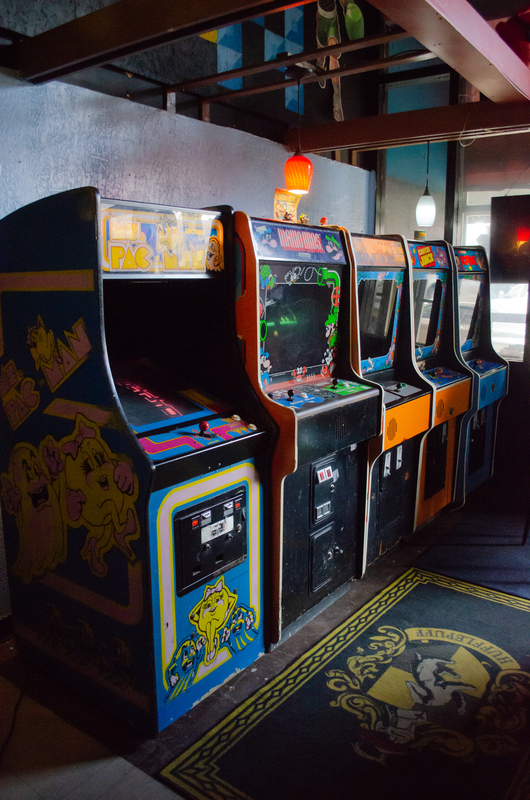 On one wall of the gaming room is a locked door, what Marcus calls the ‘secret room’, which will have a different mystery arcade video game each month and will only be open on the weekends. And he has cartoons playing continuously on a big screen TV. Another attraction in the mansion is Mrs. Nesbitt’s Cereal Bar. Why? Because who doesn’t remember getting up on a Saturday morning with a big bowl of cereal and playing your video games? He likes to keep some rare and off-the-wall cereals on hand for people to try, like Sour Patch Kids or chicken waffle cereal. And he stocks some retro drinks like Surge and Crush, and boasts that he is the only place in town to find Homer Simpson’s favorite Duff Beer, which is actually an energy drink. Marcus has also come across some interesting books written for children with titles like Die Hard and Back To The Future, so story time might soon be added to the Mansion’s features. So consider this article as a personal invitation from DJ MF Maniac himself to visit Maniac’s Mansion weekdays from 2 to 8:30, and weekends 2 to 10:30. 710 8th St., adjacent to 8th Street Coffee House.